Prof. YUMOTO was born in Tokushima (Shikoku Island), Japan in 1959. He has been very interested in natural history, eg. plants and animals, rocks and minerals, etc. since his childhood. In High School, he was a member of the mount-climbing club as well as the biology club to enjoy outdoor life mainly on Shikoku Island. He was very impressed by a series of Kinji IMANISHI’s literature, a famous ecologist and mount-climber from Kyoto University, and he decided to enter in Faculty of Science, Kyoto University. After graduating from the Faculty of Science, Prof. YUMOTO joined the Graduate School of Science, Kyoto University. He learned plant ecology under Prof. Hideo TABATA in the Laboratory of Plant Ecological Studies (which later merged into the Center for Ecological Research). Prof. YUMOTO has been studying "plant-animal inter-relationships". As terrestrial plants are sessile organisms, there are only two occasions to move: stages of pollen and seeds. Plants sometimes use wind and water as a vector for moving. But many plants, typically angiosperms have evolved to utilize animals as vectors for pollen transfer and seed dispersal. This is one of the reasons why angiosperms are so widespread around the world today. The animal vectors which transfer pollen are called pollinators, and those which disperse seeds are called seed dispersers. The main research topics of Prof. YUMOTO are about plant-pollinator relations and plant-seed disperser relations. In addition to there is another relation concern anti-herbivores. Some plants depend on predatory insects to repel herbivorous insects: some typical examples are found between ants and plants in tropical regions. One of the major concerns to Prof. YUMOTO is "how do plants utilize animals for the sake of plant lives? ", because plants are usually regarded as passive organisms. In the master course of graduate school, Prof. YUMOTO began his academic carrier studying alpine plant vegetation on Mt. Kiso-koma in Central Japan. 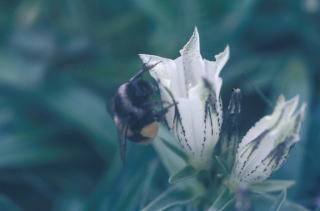 He studied plant-pollinator relations there. There are several advantages to study alpine plants, 1) short flowering period, 2) flowering near the ground, and 3) less diverse fauna and flora. However, those advantages also limit the scope of ones research. In the doctoral course, he desired to study a more diverse and complex plant community and began to study an evergreen broad-leaved forest and a mixed coniferous and broad-leaved forest on Yakushima Island, Southern Japan, which was later designated a World Natural Heritage site in 1993. As many trees and climbers (lianas) bear flowers on the upper surface of the forest, we call it a "canopy". He had to climb trees to observe flowers. He adopted a rope-climbing method which was invented for rock climbing and caving, and he climbed trees up to 25 m above the ground. One day he fell from the tree, and lost consciousness until the following day. When he got a job at Kobe University in 1989, he began to study plant-seed disperser relationships in Yakushima Island. He and his colleagues studies the roles of migrant birds as seed dispersers, and of Japanese macaques (Macaca fuscata yakui): he followed monkeys all day to study their handling behavior of fruits and seeds, and the fate of seeds which are dispersed by them. Also, he joined several research teams overseas to study the seed dispersal by primates and other animals in Kahuzi-Biega National Park (Democratic Republic of Congo), Noubale-Ndoki National Park (Republic of Congo), and Macarena National Park (Colombia). He is grateful to many primatologists for the opportunity to conduct research in these great places. 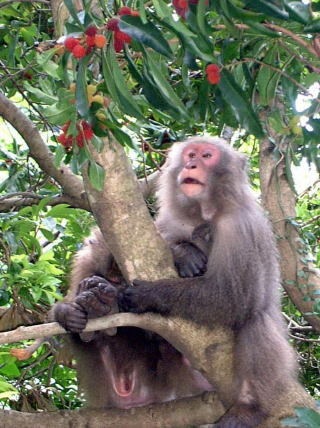 Left, Japanese macaque in Yakushima Island (Macaca fuscata yakui) and fruits of red bayberry (Myrica ruybra). 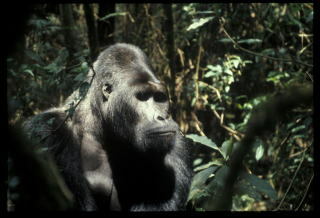 Right, Eastern lowland gorilla (Gorilla gorilla graueri) in Kahuzi-Biega National Park (DRC). 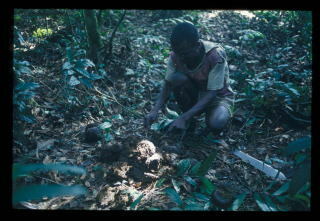 Left, Proving dung balls of African forest elephant (Loxodonta cyclotis). 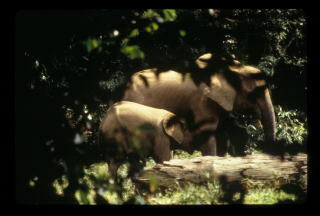 Right, A mother and the offspring of African forest elephant (Loxodonta cyclotis) in Noubale-Ndoki National Park (Republic of Congo). 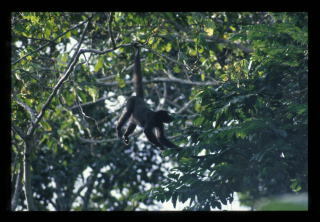 Left, Wooly monkey (Lagothrix lagothricha) in Macarena National Park (Colombia). 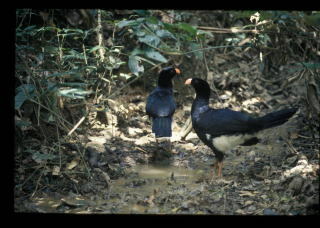 Right, A pair of Salvin's crassow (Mitu salvini) in Macarena National Park (Colombia). After he moved to the Center for Ecological Research, Kyoto University in 1994, he obtained further opportunities to study Southeast Asian forests. 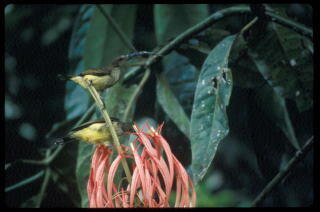 He joined a research team to study the phenomena of mass-flowering and complex plant-pollinator relations in Lambir Hills National Park in Sarawak, Malaysia. He organized a team to study seed dispersal and seed predation by large mammals and birds in Khao Yai National Park, Thailand. He also supervised graduate students to study the fruiting phenolgy on Mt. Kinabalu and on insect seed predators in Pasoh Reserve, Malaysia. The achievements of this work have been published in many academic journals, and some parts appeared in two paperbacks for Japanese readers: "Yakushima Island: a Home of Elder Cedars" (1995, Kohdan-sha) and "Tropical Rainforests" (1999, Iwanami-shoten). 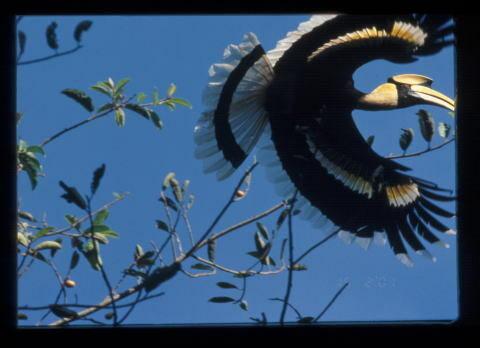 Left, Great hornbill (Buceros bicornis) in Khao Yai National Park (Thailand). 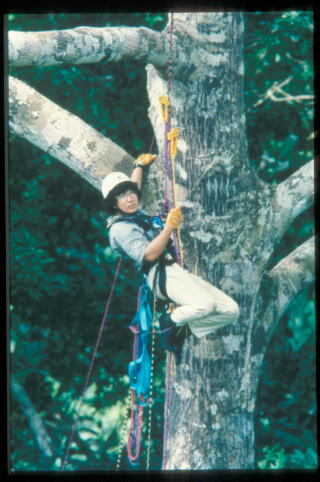 Right, Tree climbing in a tropical rainforest in Borneo (Malaysia). Prof. YUMOTO moved to Research Institute for Humanity and Nature in 2003. He organized a collaborating project "A new historical and cultural exploration into human-nature relationships in the Japanese Archipelago" in which more than 130 researchers were involved. He took a trans-disciplinary approach to study the environmental history of Japan. The central question of the project was “why the Japanese Archipelago is a biodiversity hotspot?” As Japan has been densely populated for two millennia, most parts of the land have been heavily impacted by human activities. But there are places still very rich in fauna and flora, including large mammals, and a lot of endemic amphibians, freshwater fish and vascular plants. His team studied the origin of semi-natural grasslands and Satoyama, and tried to identify refugia where many endangered species have survived under both climatic and anthropogenic pressures, from the perspectives of ecology, pollen analyses, molecular phylogeny, archaeology, written and oral history, and so on. Their achievements have been published in many academic papers and articles, and Japanese readers can find major results of these collective works in six volumes of "35,000 years of the Japanese Archipelago- an Environmental History of Human-Nature Relations" (2011, Bun’ichi-sogo-shuppan), "Compiled Book on Environmental History of Amami-Okinawa" (2011, Nanpou-shinsha), "New Akiyama Travelogue" (2012, Kohshi- shoin). In 2012 he moved to Primate Research Institute, Kyoto University, and has resumed his study on relationships between plants and primates, including great apes, as he has studied on the foods and habitats of primates for almost 30 years. He is willing to organize his research for the purpose of conservation of primates, and he also desires to contribute to the most important question at the Primate Research Institute: "From where did human beings come, and to where will they go".